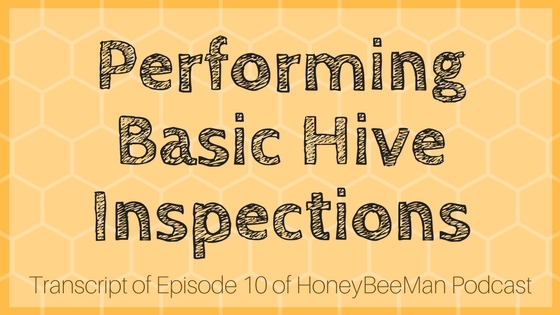 Today we’re going to talk about hive inspections; what is needed during a hive inspection, how to do a hive inspection, and what to look for. To get started, the things that you’re going to need are a smoker and a hive tool. Other than a lighter and some good smoker fuel, that’s about all you’re going to need to get started other than, obviously, your personal protection equipment. You want to have your veil. You never want to open a hive without a veil. There’s just too many things that can go wrong with mean bees, so you want to have your veil on. If you’re really brave, you can go without a suit, but I’m going to have at least some sort of suit on or have one nearby. To do a hive inspection, have all of your tools that you think you’re going to need nearby. You want to have your smoker lit and going good, so that you don’t have to worry about it going out. Once you have that lit, or even before you’ve got that lit, a good idea is to just stand back 10 feet away from the hive – not directly in front of the hive, off to the side – stand back and watch the front of the hive. I find this very enjoyable. You want to stand there and see what’s going on from the outside. How many bees do you count going in and out of that hive? Just stand there for a minute and count how many bees you see coming and going. If you see lots and lots of bees coming and going, that’s a good sign. Now you need to look closely at the bees. Do they have pollen on their hind legs? Are they carrying pollen into the hive? If they are, that’s a great sign. Is there a water source nearby? Often, on a cool evening in the summer, you can see bees going from the water source back to the hive. If you walk to your water source, you can actually see the bees picking up water around the edge of the puddle, creek, stream, or whatever it is. You can actually see the bees taking water and then carrying it back to the hive. You can see them making a beeline to the water and then right back to the hive. Those are just some things to look for before you even open the hive. You just want to see what’s coming and going, see whether they’re bringing in pollen, see if you can tell where they’re going. Sometimes you can, sometimes you can actually tell where the bees are going. I have one bee yard where the bees go for a plant nursery and they all go one direction, they don’t seem to go anywhere other than that plant nursery. It just depends what nectar sources are available, but certain times of the year they go that direction and it doesn’t seem like they go anywhere else. You just want to kind of see what’s going on with the hive. 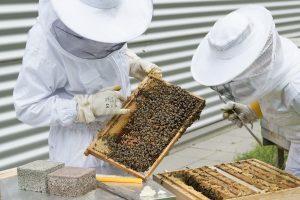 Once you inspect the outside of the hive and you know how many bees are coming and going, you know whether they’re bringing in pollen or not, then you can have your smoker and you go ahead, very slowly and gently, walk up to the back or side of the hive. You never want to approach it from the front; this just sets off the guard bees and they’ll come out and see what you’re doing, and typically they’re not going to be too happy to see you. It’s best just to approach from the rear of the hive. Give a couple puffs of cool smoke in the front entrance of the hive. You can kind of do this from the side so that you’re not interfering with them as they come and go. Once you’ve given them a couple puffs of smoke in the entrance, then you wait a few minutes. You’ll be able to hear the bees try to blow that smoke out of the hive. If you have a screened bottom board, you can actually puff a couple of puffs underneath the screen and that will do the same thing. You can hear the bees, it will sound like they’re getting mad, but all they’re really doing is flapping their wings trying to get that smoke out of the hive. You need to listen, the sound of the hive is really important. Once you’ve given them some smoke on the front and you stand there and see what kind of reaction you get. Hopefully you won’t get a big reaction. You want to do this inspection during the hot part of the day, also. You don’t want to do this in the evening when it’s cooling down. This is something that you do during the hot part of the day. The reason for this is that the workers are out in the field. You want to do your inspections when the workers are not there guarding the hive. A cold and rainy day would be a bad day to do an inspection. Warm, hot, summer day when the bees are out working and bringing in nectar is a good time to inspect the hive. You crack the top of the hive open – gently, try not to make much noise. When you crack that seal loose between the boxes, it’s always going to pop. Just try to avoid making too much noise. It’s always going to crack, so you just do it gently so that you don’t disturb too many bees. First you’re going to have the cover to take off. Once you take off the top cover, you’re going to have the inner cover with the hole. You’re going to give that a little puff of smoke also. That will stop the bees from coming out at you. Once they hit that puff of smoke from the top, they’ll stop coming out at you. Once you’ve done that, you want to go ahead and crack the top inner cover loose, and that will expose the top box. If the top box is a honey super, you want to go ahead and remove all of the honey supers one by one very gently. It’s ideal if you have an extra deep super sitting around that’s just empty, you don’t have to have any frames in it, just an empty super, you can have that sitting at the side of you while you’re doing your hive inspection and then the honey supers you can just stack them across a deep empty. That just keeps it up off the ground and you’re not having to sit your supers down on the dirt or weeds. You can just set them up on another box, which is ideal if you have an extra. Once you have set your honey supers off, you’re going to go down into the frames and you’re going to see the deep frames. Let’s assume that you have one deep box. You’re going to go down into this deep box and you’re going to do some inspections. To get this box open, you need to give an occasional light puff of smoke in on top of each box. That just keeps the bees calm. Once you have the deep box exposed so that you can see the 10 frames in there, it’s usually easiest to take the first frame out of either side from one of the edges. Take that frame out. The way to do that is to use your hive tool and pry between the wooden frames (or plastic frames, depending on what you’re using), pry between those very gently and very carefully, and pry those loose. They’ll always be kind of glued down with wax or propolis, so you’ll want to break those loose. Then you want to lift the first one out and set it aside. You can look at it before you set it down. Generally, the ones on the outside are going to have the least amount of activity. The ones on the outside are generally not your most important frames, they’re not going to have all that much activity on them. Typically, you can set that one aside. It’s always a good idea on each and every frame to look it over and see if you can see the queen. She’ll be bigger with a longer body. You’re also going to see drones, which are big and they have no stinger on the back, so you can tell the difference. The drones are usually very fat and short, so you can tell the queen’s longer body and she does have a stinger. Once you have that first frame out, you need to break the rest of the frames loose one by one, very slowly and gently. What you’re looking for is a brood pattern, a nice oval shaped brood pattern. You’re going to see eggs on the inside of the cells. If you see a full oval of eggs or larvae, different forms of the egg, that’s what you want to see. Once you establish that you have eggs in that hive, you know that the queen has been there within the last three to five days and that’s a good sign. That’s what I look for in a hive inspection is to make sure that the queen has been laying eggs. As long as I see eggs, I know the hive is healthy. The more of these frames that are covered with eggs, the better off you are. Up towards the corner of each frame, you’re also going to see pollen. You’ll see some water or honey, occasionally, on the corners of the frames. The frames themselves, the main thing that you’re looking for is eggs. Hopefully that gives you a little bit of a background. I know this is very quick and brief, but that’s what a typical hive inspection looks like. Then you reassemble the whole hive and you want to leave it the way that you found it. That’s it. Have a great day.